This page provides information about the Aberdeenshire area including travel information, accommodation, and things to do. Travel information is provided here with directions for reaching Aberdeen by road, by rail and by air. Elsewhere in this site, the venues section gives detail of the individual locations in use for the sound festival, along with maps for their locations. There is an overnight sleeper service from London to Aberdeen, hourly trains from Glasgow and Edinburgh or direct services from London, Birmingham, Plymouth, Newcastle, York. 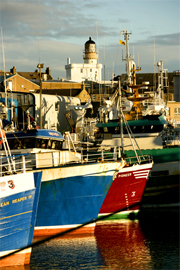 Aberdeen is accessible by road from Edinburgh or Glasgow in around two and a half hours. From Glasgow take the M8/M80-A80/M9-A9 north to Perth or from Edinburgh the A90-M90 north to Perth, and then the A90 trunk road to Aberdeen. Alternatively from Perth, take the more scenic A93 over Glenshee and via Braemar. Aberdeen Airport is situated 7 miles north west of the city. It is served by flights from throughout the UK, including daily flights to and from London, as well as international destinations such as Amsterdam, Dublin, Esbjerg, Paris and Stavanger. We are pleased to be associated with the Aberdeen Douglas Hotel to offer reduced price hotel rooms from Thursdays to Sundays during the festival. Peacock Visual Arts is the main contemporary visual arts organisation in Aberdeen and the North-east of Scotland. Aberdeen Art Gallery opened in 1885. In its elegant marble-lined interior is displayed a varied collection of works of art, including outstanding examples of Modern Art, and work by the Impressionists and the Scottish Colourists. Visitors can also see contemporary craft, Aberdeen silver and a wide range of decorative art. Limousine Bull is a committee-run artists' collective which has been resident in Torry in Aberdeen since January 2005. North East Open Studios is an award winning collective of artists, makers and galleries based in northeast Scotland, who open their doors to the public yearly. The Cairngorms National Park has the largest area of arctic mountain landscape in the UK at its heart, with diverse communities around it. It is home to 16,000 people and 25% of Britain's threatened birds, animals, and plants. It includes moorlands, forests, rivers, lochs and glens. The Aberdeenshire coast is peppered with attractive fishing villages such as Pennan, film location for local hero, and Portsoy. 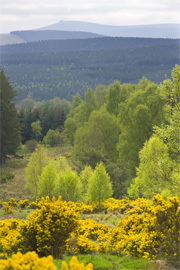 Inland there are also many attractive villages and areas to visit such as Royal Deeside.